How we can save our heritage breeds by “Eating them to save them”, and why we need to. A week old Berkshire piglet. Each year I raise and kill animals that are endangered. My husband and I breed, and eat, Berkshires, an old fashioned breed of pig whose current status is registered as critical, by Rare Breeds Canada. “How does eating them, help to save them?” I am asked by visitors to the farm. “ How can you kill them?” they ask, as they watch baby piglets chasing each other through the trees. You can watch them too, here. 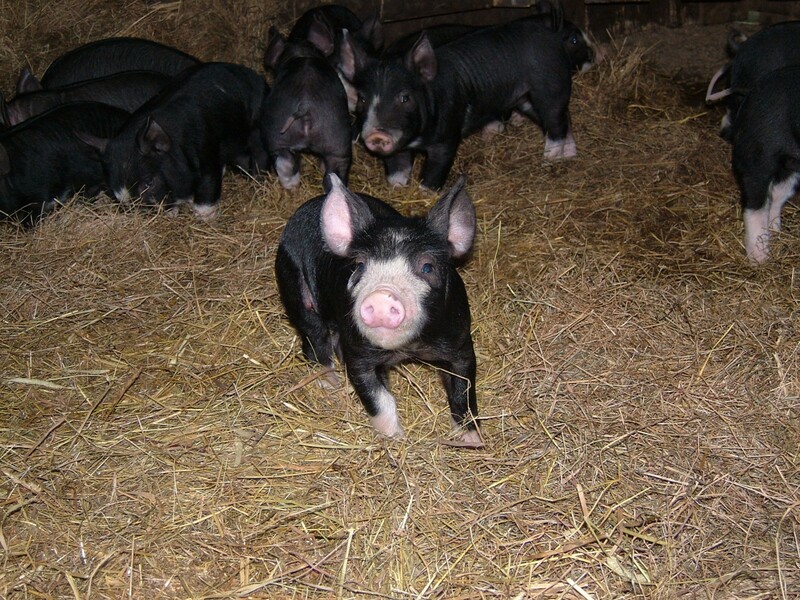 Only by an increasing demand by consumers for my Berkshire pork, will I be able to continue to breed my sows each year. As meat sales grow, then more of my animals can be saved from the knife, to stay on the path to maturity and give birth to piglets of their own. Put simply, without a niche market for the meat, a farmer would be forced to abandon his rare breeds. He would quickly switch to other means of providing for his family and the breed would surely disappear. So next time you buy lamb chops from a farmer that raises Jacob sheep, or you order prime Angus beef from the steakhouse, realise that you are helping to save the breed. By chomping down on that steak, you are enabling the farmer to make a living from raising, and saving, an endangered breed of animal. Only by your appetite for succulent, full flavoured meat, will these animals continue to be a part of our farming landscape. The success of today’s livestock industry is partly attributable to modern, mainstream breeds that are both high-yielding and commercially viable. We now have dairy cows that give vast quantities of milk, hogs that efficiently convert grain into meat in little more than five months, and beef cattle that can meet the ever increasing call for burgers. While it would be foolhardy not to recognize and appreciate the commercial importance of these breeds, we should remember that their valuable production traits derived from the careful, selective breeding of our heritage animals. The future of farming, is dependant on the preservation of the genetic diversity that these rare breeds represent, each with unique traits, such as disease resistance, good mothering abilities, or resilience to harsh weather conditions. In much the same way as artists will always keep the primary colours in their paint box in order to mix new, exciting colours, the livestock breeder will always need pure genetics in order to produce new, improved animals. Without this base from which to work, the end result becomes muddied and unpredictable. If we are to continue to develop farm livestock capable of meeting the demands of the customer and able to withstand ever-changing environmental conditions, we need the genes of our heritage breeds. While it certainly appears to be a contrary argument to “Eat them to Save Them”, it really is the only way to save these unique animals. When my customers sit down to enjoy a breakfast of bacon and eggs, produced by my Berkshire pigs and Rhode Island Red hens, I hope that not only do they appreciate the full and rich flavours, but they also understand what these breeds from the past can offer to the farms of the future. If you’d like to read more of my homesteading adventures with pigs, chickens, and bees, then sign up here for my newsletter, or check out my blog. Please share the message to save our breeds by clicking on the green heart.